Adjunct Professor Sean Olivas (center left) with UNM Law School students Marcus Sedillo (second from left) and David Domingos (third from right). Olivas recruited three judges who are fellow classmates from the UNM School of Law Class of 1995 for the students’ final practice for the moot court competition. For months, Adjunct Professor Sean Olivas (Class of 1995) helped prepare David Domingos (Class of 2018) and Marcus Sedillo (Class of 2018) for the Hispanic National Bar Association Moot Court Competition. He coached them on their oral advocacy skills while they prepared for the national competition, which brings together over 30 teams of law students from the nation’s law schools to argue a case currently pending before the U.S. Supreme Court. To act as practice coaches, Olivas brought together attorneys from his and other civil defense firms downtown. Additionally, because this year’s issue involve a complex matter of federal criminal procedure, he was also able to involve Assistant U.S. Attorneys and a federal public defenders in critiquing the students. 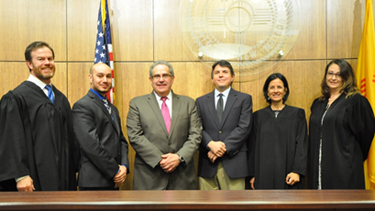 David Domingos (Class of 2018) practices for the Hispanic National Bar Association Moot Court Competition at the New Mexico Court of Appeals in front of Judges Yarbrough, Vanzi and Dominguez. For the penultimate practice, Olivas had a special treat. He asked three sitting judges from his class of 1995 to critique the students. Chief Judge Linda Vanzi of the New Mexico Court of Appeals, Federal Magistrate Judge Steven Yarbrough and Judge Maria Dominquez of the Bernalillo County Metropolitan Court gathered with Olivas and his team at the Court of Appeals. “My classmates’ participation in the practice was a thrill for me and for the students. Not only did they ask insightful and complex questions, but they also demonstrated the sort of community that forms during law school at UNM and continues after 20+ years,” said Olivas. 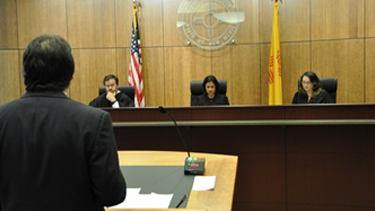 The final practice, also argued at the New Mexico Court of Appeals, was before Judges Myles Hanisee and Michael Bustamante, both of the New Mexico Court of Appeals, and Chief Judge Christina Armijo of the U.S. District Court. “Because Judge Hanisee had served with the U.S. Attorney’s office, and Judge Armijo sits on the federal court bench, they both were familiar with the issues in this case and helped prepare the students in as close to a ‘real life’ setting as you can get in practicing for a moot court competition,” said Olivas. “The competition was amazing, as was Miami,” adds Sedillo.